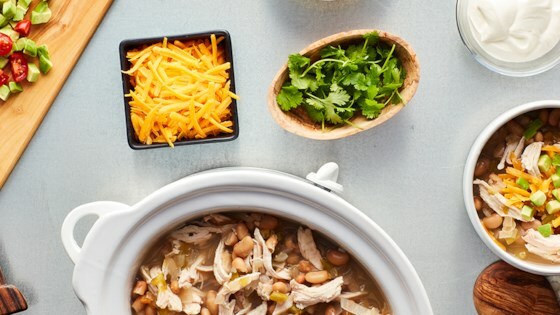 "Chicken breasts seasoned with Hidden Valley® Ranch Seasoning and chili powder are simmered in a slow cooker with green chiles and white beans to make this white chicken chili." Place chicken breasts in the pot of a slow cooker. Sprinkle with the Hidden Valley(R) Ranch Seasoning mix and chili powder. Top with the onion, green chiles (with liquid), beans, and chicken broth. Stir together and cover. Cook on high heat for 3 to 4 hours or on low for 6 to 8 hours.